Welcome to Smitten, Vermont. With the help of four friends, it’s about to become the most romantic town in America. The proposed closing of the lumber mill comes as unwelcome news for the citizens of Smitten. How will the town survive without its main employer? A close-knit group of women think they’ll be smitten too. In a town called Smitten, their main source of income is their lumber mill. With the lumber mill comes the men, who’s used to providing for their families, content with the life of being men despite the fact that their town had a very…well, feminine name. What happens then, when the town’s only source of income closes? The women come to the rescue, of course. Taking advantage of the town’s name, a group of friends planned to turn their town into a romantic tourist spot. Armed with lots of ideas and a whole lot of faith, Natalie, Julia, Shelby and Reese work with the rest of the town to and pray that their ideas would take off and put Smitten on the map — and maybe, along the way, they would find someone to be smitten too as well. I love short stories and anthologies for the simple fact that they’re so easy to read and digest. I got Smitten from Netgalley because of that, followed by the fact that one of the authors in this book, Kristin BIllerbeck, is a favorite. I was in the mood for a cozy romance last month (being February and all) while I was in the middle of some (sort of gross) zombie books, so I picked up Smitten ready to be, well, smitten. Interestingly, the authors of this book are all friends with each other in real life, and they even had a note at the start of the book to share their story of their friendship. Like I said, the only author I have read there is Kristin Billerbeck, so I was looking forward to reading what she wrote there, and I was also curious with how the other authors write. Maybe this would convince me to get some of their books too. The best thing about this book IMHO is the setting. The town of Smitten came alive to me from the first page, and I was rooting for the girls’ ideas to come to fruition in the town. Smitten seemed like such a picturesque town that needed some feminine touch, and I looked forward to reading how the town improved towards the romantic direction in each story. It may seem a little too much of a perfect town at some point, and maybe if I thought of it a little further as a too nice town it would be a bit creepy. But I want to be there, and I want to spend some time in their town even if I wasn’t a part of a couple. The stories were pretty entertaining, too, although I can’t say I liked all of them. This is a collection of stories but I realized that it’s not really an anthology because the stories are all connected to each other and you can’t read the next without reading the one that precedes that because you’d get spoiled. Think of it as a series of spin-offs in a book. The thing with short romance stories, though, is they don’t have as much time to develop the romantic relationship from the ground up. By this, I mean, the stories can’t really start from the two characters getting to know each other for the first time and then their relationship developing from something because it would need a longer length to make the relationship feel more realistic to avoid the risk of it being another insta-love story. Unless of course that is the real intention. But anyway, with this in mind, the love stories in Smitten were all about the girls and their old time friends or old acquaintances in the town that they never really paid attention to, or have pined for but has been unrequited for some time until this. To be perfectly honest I had a hard time adjusting to that because I was used to reading full-length novels with the romance starting from the very start. The idea of old-time friends suddenly turning into lovers took some time getting used to1. But once I got used to it, I got all the nice tingles when the stories developed. 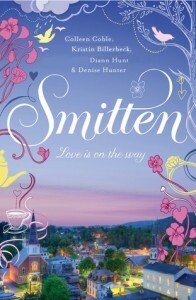 But as nice it was for the romantic relationships to start from friendships in Smitten, I felt that the shortness of the stories kind of hindered the book from delivering a bigger “oomph”. For some stories, I was just getting used to the two characters dancing around each other and (wholesomely) flirting when suddenly, they’re on their first date or someone’s confessing their love or someone is stealing a kiss from someone. Before I got used to that, the couples are fighting, or having an argument or dealing with old issues. The only story that didn’t feel too abrupt at some point was the last (my favorite among the four), and it even had some kind of foreshadowing from the previous story, which made it exciting for me because it felt like a spin-off (and you know how I love spin-offs). I’m sure the word count limit is an important factor and it’s one of the things that made the stories so and we can’t really do anything about it as a reader. I just really wish that the stories were just a little bit longer. Rachel has leukemia, and Greg’s mom gets the genius idea that Greg should befriend her. Against his better judgment and despite his extreme awkwardness, he does. When Rachel decides to stop treatment, Greg and Earl make her a movie, and Greg must abandon invisibility and make a stand. I admit: I requested this book on Netgalley because of the cover. Don’t you think it’s so cute? This is the kind of cover that I would want to be printed as a poster and placed on my room. Or over my desk. The colors in this cover is enough to cheer me up, and I wouldn’t mind just looking at it without really knowing what’s inside. Oh but wait, I actually read it. I don’t know about you, but the book’s synopsis reminded me of a John Green novel — and not just because The Fault in Our Stars had a girl with cancer in it1. Even the start of the book kind of reminded me a bit of Green, with the geeky guy and the “sidekick”, but that is really pretty much where the similarities end. Here’s the thing about Me and Earl and the Dying Girl: this book had a guy named Greg who’s content with just skimming and being under the radar and not making any real friends so he won’t have to be ridiculed for being a part of a group. The only “friend” he had is black-guy Earl, who’s had a difficult home life and whose default expression is “pissed”. And then there’s Rachel, the dying girl who Greg used to be linked to, and is linked to again because his mother asked him to visit her and keep her company. And there are movies, too – home movies, since Greg and Earl are big time movie fans and pseudo movie makers. Secret movie makers because they never let people watch any of them, until Rachel came along anyway. Here’s another thing: this book doesn’t really have a real and solid plot that isn’t mentioned in the title. This book really feels more like a study on high school and how a kid deals with having a friend (who he won’t admit is really a friend) who’s battling cancer. And even then, Greg didn’t even admit it. He isn’t out to win any trophies for friendship, or any of his abilities for that matter. Greg is so down on himself and what he can do that it made my heart hurt. At one point in the book, I wanted to shake him and say that he better snap out of his “Oh I’m good for nothing so I’ll just make you laugh” type of thoughts. I guess there was just too much self-deprecating quips in the book that it got me a bit turned off — it’s either I’m just too positive, or his character is really just too negative. I’m not really sure. That being said, though, Me and Earl and the Dying Girl really is hilarious, and it’s a good book to lift you out of a bad mood with all the quips and tangents and all the movie stuff (if you don’t think of the things I mentioned in the previous paragraph and stuff). I also loved Earl — maybe even more than I liked Greg — for all his tough-guy persona with a soft heart inside. I can imagine his “pissed” and “mega-pissed” expression, although I can’t exactly think of him as an actor. I think most of my LOL time happened when Earl was present, although he also showed that he had a more difficult life compared to Greg. Personally for me, if anyone had the right to complain about his life, it was Earl. Rachel also had more rights to complain, with the cancer and all. I liked Rachel’s quiet presence in the story, her snort-laugh and how she changed (but also not really changed) Greg’s life. I thought all the scenes with her was pretty poignant, and I liked how she really tried to help Greg even if he wasn’t willing to be helped that much. Their dynamic was pretty unusual, but it worked, and it really made the book true to its title. Overall, this book is an enjoyable read, albeit not really as much as I expected. I guess I was used to having books make me feel so many things and think so many things that I imposed these expectations on Me and Earl and the Dying Girl too, when it’s really not that kind of book. I doubt this will be one of my favorites but in the grander scheme of things2, this book is one I’d recommend for anyone who’s looking for a few lot of good laughs. 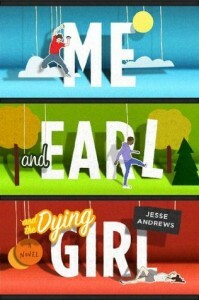 Me and Earl and the Dying Girl by Jesse Andrews will be out March 1. Tessa Lancaster’s skills first earned her a position as an enforcer in her Uncle Teruo’s Japanese Mafia gang. Then they landed her in prison for a crime she didn’t commit. Now, three months after her release, Tessa’s abilities have gained her a job as bodyguard for wealthy socialite Elizabeth St. Amant and her three-year-old son.But there’s a problem or two … or three …. There’s Elizabeth’s abusive husband whose relentless pursuit goes deeper than mere vengeance. There’s Uncle Teruo, who doesn’t understand why Tessa’s new faith as a Christian prevents her from returning to the yakuza. And then there’s Elizabeth’s lawyer, Charles Britton, who Tessa doesn’t know is the one who ensured that she did maximum time behind bars. Now Tessa and Charles must work together in order to protect their client, while new truths emerge and circumstances spiral to a deadly fever pitch. Factor in both Tessa’s and Charles’s families and you’ve got some wild dynamics—and an action-packed, romantic read as Tessa and Charles discover the reality of being made new in Christ. What do you get when you cross the niece of the head of the Japanese mafia with a Southern belle in need of protection and a straight-edge lawyer who hates the said mafia? Tessa Lancaster is the niece of Teruo Ota, the head of the San Francisco yakuza. Left by her dad when she was young and living with a difficult relationship with her mom and sister, she becomes some sort of mercenary to her uncle’s mafia, working as an enforcer for her mafia cousins. She was doing fine just like that until she decided to take the fall for her cousin Fred’s careless murder of his girlfriend, landing her in prison. Seven years later, Tessa is out, and she’s turning over a new leaf, after meeting Christ in prison. But her reputation precedes her that everyone’s still afraid of her, making it hard for her to live a normal life. Until she meets Elizabeth St. Amant with her three-year-old son on the run from her husband who’s trying to kill her. Elizabeth hires Tessa to be her bodyguard, which would be a fine job if not for Elizabeth’s lawyer, Charles Britton. Unbeknownst to Tessa, Charles was the reason why Tessa served extra years in prison, and Charles does not trust her…but he can’t deny the attraction that he feels for her. Throw in Tessa’s Uncle wanting her to work for him again, her mom, her sister and her new found faith, and…well, God only knows what could happen. 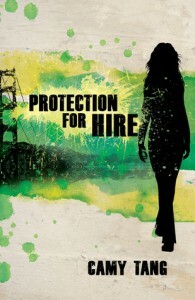 I’m not just saying this because Camy is one of my favorite authors, but really, Protection for Hire was such a fun book. 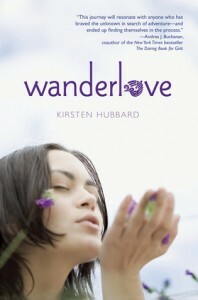 This book is reminiscent of her Sushi series with all the wackiness and hijinks that the characters get into. But because Tessa had such a shady past and a heavy responsibility on her shoulders, there were more risks involved for her. She’s not one who’s worried about things such as zafus or make-up, but life and death situations. Tessa reminds me a bit of Venus, my favorite Sushi sister, but a bit more vulnerable especially since she’s been trying to live her faith. Her vulnerability is what made Tessa so endearing, and I rooted for her from the start up to the end. The other characters surrounding Tessa were a hoot, too. Camy’s characters are one of my favorite things to read in her novels. They always feel so real, and I felt like I could easily be friends with them. In Protection for Hire, I loved Charles’ family, especially his mom and his brother! Such a darling family, and I don’t care if Charles’ mom cooks all the random food. Plus, she was a breath of fresh air from Tessa’s annoying (yet, well meaning…most of the time, anyway) mother. As always, there’s the heroine’s crazy family, which seemed to be a staple in Camy’s stories. I thought Tessa’s immediate family would be similar to the Sushi sisters’ clans, but I was glad that it turned out to be different, and dare I say, more entertaining to read. The Japanese mafia aspect was very interesting too. It was the first time I’ve read about the yakuza, and while it wasn’t really discussed in detail here, I liked the overall mafia/The Godfather-like feel that the story had. Now, I wouldn’t have liked this so much if the plot wasn’t as good as the characters. There’s lots of action, funny moments and yes, romance, in Protection for Hire, enough to keep me glued to the pages. There were moments of shock, too — the good kind, the one that made me sigh and smile with delight when it happened. :) There was enough suspense in the story to have me guessing about what exactly were they up against. It almost came to a point where I was a bit overwhelmed with all the plot twists but in the end, I think it still paid off well. The wrap up at the end felt just a teensy bit rushed for me, but I guess it was still in character given Tessa’s family.